Are you looking for a safe and reliable way to tow your trailer without all of the hassles of difficult to rig towing bars? Tired of using chains and cables? Then upgrading to Swift Hitch is one of the best ways to ensure a safe trailer hook-up and a smooth ride! Swift Hitch offers the latest technology to aid an easy tow hitch connection and gives peace of mind for those who are new to trailer towing. The Swift Hitch wireless camera plays the main role in giving you access to a view of your tow hitch that was otherwise inaccessible from the driver’s seat. The camera is made for durability and ease of use, with its strong magnetic base allowing you to attach it to the rear of your vehicle. Attach the camera to the rear of your vehicle and point it in the direction of your to hitch. This is made easy thanks to the camera’s ability to be tilted and twisted whilst secured to the vehicle until it is directly facing the tow hitch and switch the wireless camera on. 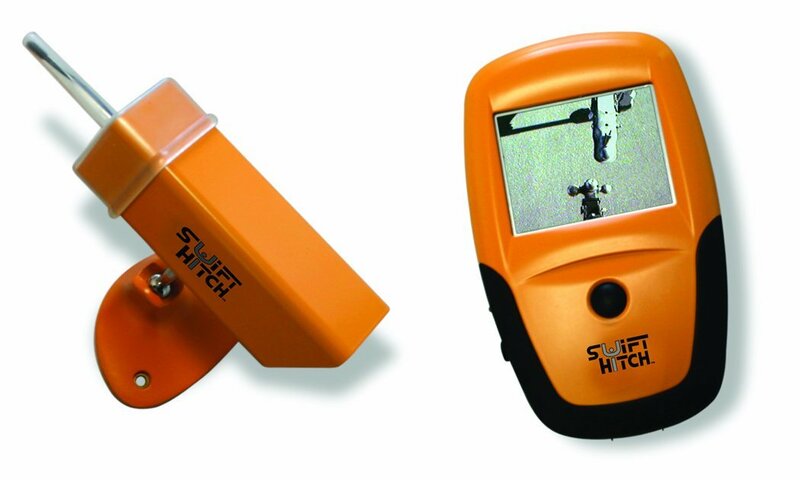 Swift Hitch includes a neat wireless display so that you can monitor what is happening on the wireless camera. As soon as you have aligned your Swift Hitch wireless camera to the rear of your vehicle and pointed it toward the hitch, switch it and the wireless display on. Before you enter your vehicle, view the position of the camera on the display to ensure you have a good view of your hitch and space where the trailer coupler will arrive in view. Reposition the wireless camera if necessary and continue to the next step. Enter your vehicle and place the Swift Hitch display in a safe place so that you can see the screen whilst safely reversing your vehicle. Use the display as an aid to slowly back up to your trailer coupler and make any necessary repositioning of your vehicle to line up the hitch and the coupler. The Swift Hitch display features a simple button you can press to mirror-image the display from left to right in order to avoid any disorientation caused by frequent glances at the camera and your vehicle's mirrors. Swift Hitch is one of many different systems in use to ensure that your trailer towing is performing safely and securely to perform your daily routines. Working in parallel with the air safe hitch is one way to enhance your road safety, improve vehicle handling when towing a trailer, as well as saving you time and effort for your work and leisure. The Swift Hitch system is a great way to avoid the permanent installation of expensive monitors and sensors, and gives you a handy, wireless and cost-effective way of ensuring your trailer is lined up and hooked up every time. Upgrade your hitch experience today with Swift Hitch.